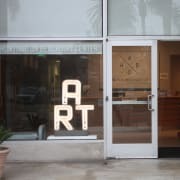 Partners in Art: The goal of the Partners in Art program is to give local elementary school students the opportunity to view a contemporary art exhibit and do practical workshops based on what they have seen. Volunteers for this program will assist with gallery tours and art workshops. Family Arts Day: Family Arts Day is an annual one day event, held in October, that provides free instructional workshops for the whole family. Volunteers for this event assist our professional artist/instructors conduct the workshops. Art at the Beach Camp: Art at the Beach is the Art Center’s most popular educational program. Held every summer, Art at the Beach art camp introduces children to a variety of different artistic techniques in a fun and educational setting. Volunteers for this program assist instructors and camp staff to bring a fantastic art experience to students. Exhibition Opening Receptions: The opening receptions at each exhibition allows the general public to enjoy and observe artwork on display. Our volunteers assist with food prep, kitchen service, and tray passing during the event, while having a fun-filled evening in the galleries. Administrative: Our direct mailing is one of the most important elements at the Art Center. Our goal is to reach out to the community about the wonderful programs and events we have to offer. Our administrative volunteer team assists with our mailings, making sure that our marketing goals are met. Volunteer requirements: All volunteers must be 18+ years of age. Volunteers must go through a pre-screening process which includes: Filling out an application and pass a fingerprint scan. Screening of volunteers includes a brief orientation of the Art Center.